As small business owners, we rely on word of mouth referrals from our customers to help grow our local business. Having a great base of customers and fans, we also love to help spread the word and do the same for our fellow local business friends as well. 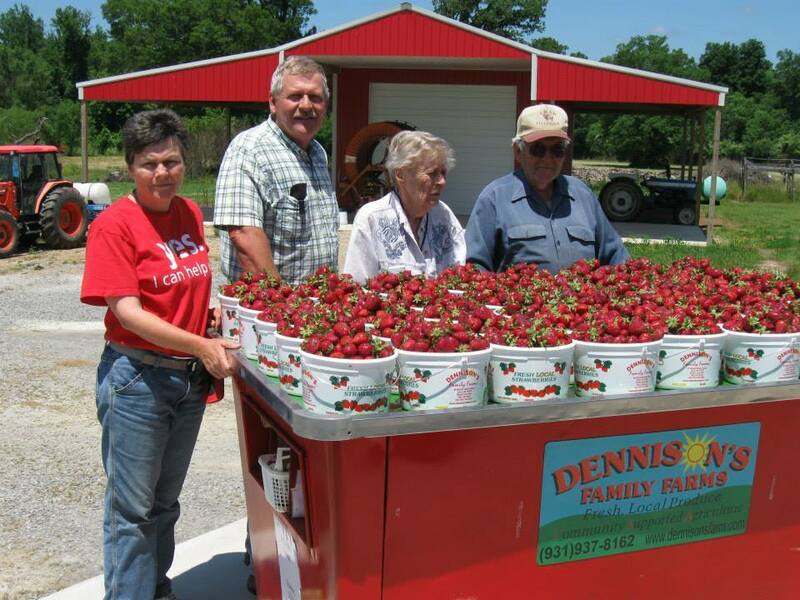 One such friend and also a great customer is Wayve Dennison and her entire family at Dennison's Family Farm in Elora, TN, which is just up the road a piece from us here at New Market BBQ. It is truly a joy getting to chat with Wayve when she comes in. She has such a wealth of knowledge with regards to gardening, farming, love of the earth and all things life! She has just a beautiful way of sharing the joy of farming and healthy eating with others and it brings me joy to give back and help spread the word about them to those who may not know of their farm. 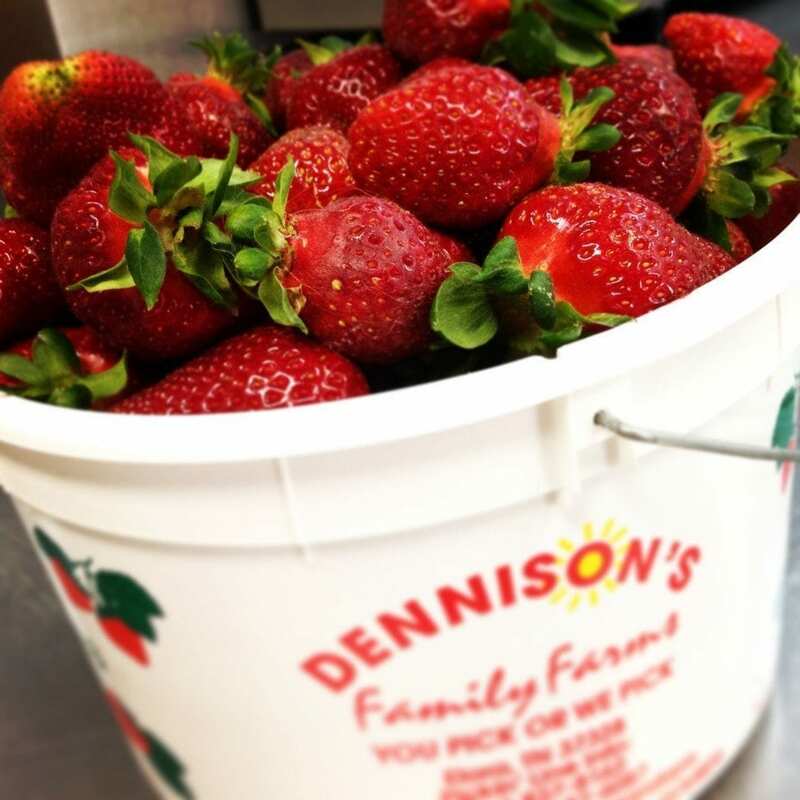 You can check out their website here – www.dennisonsfarm,com – as well as be sure to LIKE them on Facebook and let Wayve know that we sent ya – Dennison's Family Farm Fanpage. 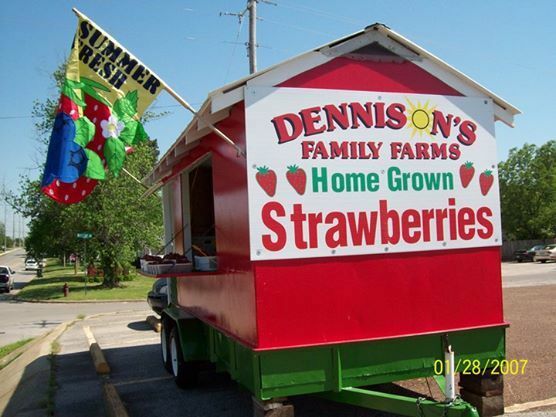 During the spring months, you can find the Dennison Strawberry Wagon out and about in various communities where they sell their amazing strawberries. Tomatoes – Late June thru Fall. Seeds are in the ground as of the end of April. Squash – Mid June Thru Fall. Seeds were planted the last week in April. Sweet Onions – June thru July. They are the sweetest tasting onions around. Peppers – July to frost. Plants are in the ground as of the end of April. Sweet Corn – Late June thru July. Seeds will be in the ground by the first of May. Pumpkins – September thru October. Gourds – Martin house gourds available year-round. So, to get to the GIVEAWAY PART – Yesterday, Wayve showed up with a Gallon of these gorgeous Strawberries in hand. She knows I LOVE THEM!! I ended up buying 2 gallons and as we were talking others on the porch asked if she had more and she sold some right away. I asked her to leave me the rest of what she had and no more than 15 minutes after she left, I had them sold for her. LOL!! So, I messaged her last night and asked if she could bring me MORE and so they did!! ONE lucky person will win a FREE GALLON of these BEAUTIFUL Strawberries today! All you have to do is comment below this blog post to qualify. How about sharing what your favorite Strawberry Treat is? How do you like to enjoy your Strawberries? As you guys know, we make an awesome strawberry cake using fresh berries!! Hint Hint on next week's dessert special..LOL!! I have FIVE GALLONS of Strawberries available for sale today. $13 each and it's first come first serve, no reservations on these beauties. We are Open 11-4 today. Our winner will be selected at random around 2 PM today, Sunday April 27th, so don't miss out!! And as always, you know we are grateful if you help us spread the word so PLEASE SHARE this post by clicking some of our Social Share Buttons above / below this blog post. Thanks for y'alls support in helping us help another local business. Hugs and hope you get out and enjoy this gorgeous day before those nasty storms arrive. Be safe! Excited and Honored for New Market BBQ to be featured in Field and Stream Magazine, again! Love them with Greek honey yogurt. I didn’t know we had another farm local. Thanks for posting. Can’t wait to check them out. Excited for strawberry season and strawberry shortcake and smoothies!!! Yum and glad to know they are close. I like them right by themselves! My favorite “treat” is strawberry cake, yum! This would make a wonderful birthday gift for me today! I never knew there was a farm there. We will go check them out! Thanks for posting this! Also Happy Birthday Libby! I like to freeze the fresh strawberries and during the hot summer pop a few in a glass of chilled wine. Helps to keep your glass of wine chilled longer and you get to enjoy a few tasty treats after the glass is empty. Oh the girls love strawberries. Stacey10 That is my Dad’s FAVORITE!! LOL! Thanks for entering HeatherCantrellOwens ! Awesome HeatherAlleyHope I know the Dennisons would greatly appreciate it!! That is a GREAT idea for your wine! Will have to try that! My Favorite strawberry recipe is strawberry lemonade cake!!!! It can be made into a 9″ round cake or even cupcakes!!!! I love me some strawberry cake and just strawberries and cool whip!! One of the best things about Summer!! Fresh Strawberries!!! !